This time John has a little help from his bear friends, because this de-cluttering is becoming unbearable. We will continue to apply John’s Japanese management techniques and find a simple bear solution. This should be interesting because we will use a quality improvement approach called Bear Kaizen. We have deliberately picked a very small issue to see if John can learn to do it the bear way. John says there are too many toilet rolls cluttering up bathrooms and toilets. Although we bears think that you can have a lot of fun with excess toilet rolls. In the main bathroom there is 1 toilet roll on the toilet roll holder, which, in a bear’s simple mind, should be the only place for toilet rolls, but there is also a bag of 7 more, half hidden under towels. In the second bathroom there is 1 roll properly on the toilet roll holder, but also 3 on a pole for surplus rolls, 1 on a toilet brush and 3 more in a basket. 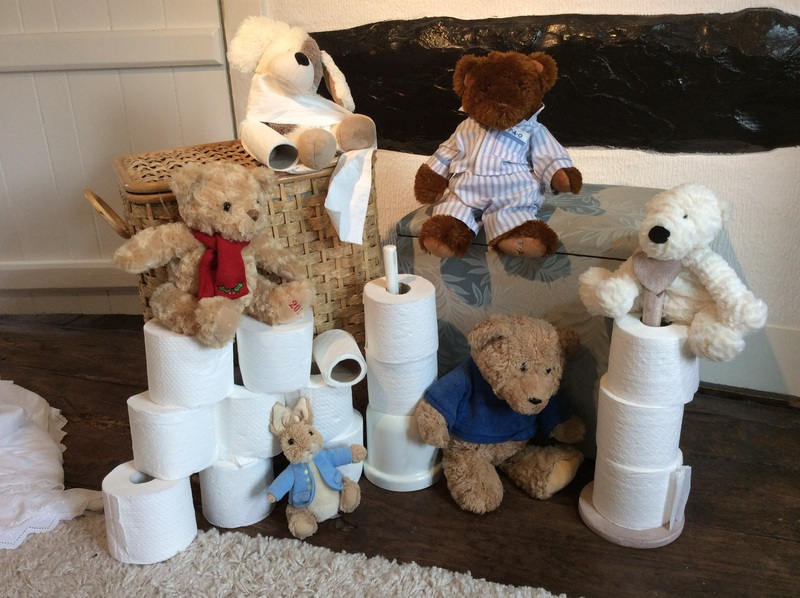 Even bears can’t use 8 toilet rolls at once, so we should be able to bear de-clutter 7. In the downstairs loo — there is 1 on the holder and 3 more on another decorative pole display. Bears are not totally convinced toilet rolls are decorative, maybe we should take up Origami classes and learn to fold toilet paper into flowers. Mo buys toilet rolls in bulk “BOGOFF offers” because they are cheaper that way. But they need to be bought 12 at a time, which means there are always a lot more than bears need. When John occasionally buys them, he always buys the wrong type so they become surplus, that’s where some of the clutter comes from. So it’s his fault really! 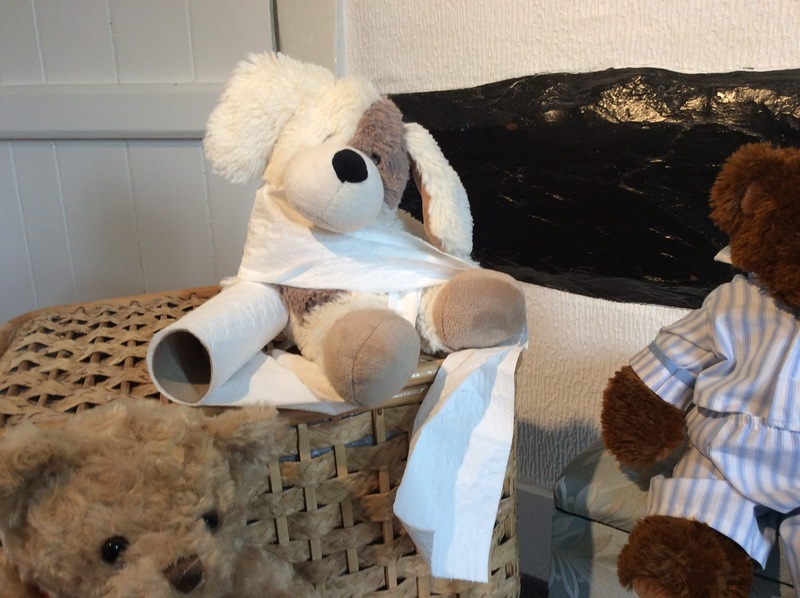 Bears never want to run out of toilet rolls. Some of us bears remember those ripped up bits of newspaper in the outside loo on ice cold winter days! They were not very comfortable on your bear bum! Excess toilet rolls means we end up with extra baskets and decorative displays of surplus toilet rolls bearly leaving enough space in the bathrooms and loo. But at least bears can have fun playing with them. On the good side, John gets a blog from the bog. There needs to be a bear operating procedure (BOP) to ensure all the toilet rolls are always full in each bathroom and toilet. Excess toilet rolls will no longer be necessary in every location. Almost-finished rolls should be removed to the second bathroom and stored out of sight in the specifically designated basket for emergency toilet rolls, until they can be used in an emergency. John will not eat prunes any more ! In case John forgets, it may be necessary to frame it and put it on the wall in each bathroom and loo. Although we are not sure MO will like this idea! Bear suggestion:- wee should put John in charge of bog roll re-supply since he seems to know all about toilet rolls. Bear success measures are — “Will it be easier, safer, faster and fun?”. Easier — YES Less frequent shopping while excess rolls are used up. Safer — YES 17 less clutter rolls for bears to fall over. Faster — YES Only if bears don’t get the runs. This entry was posted in Uncategorized and tagged Bears, Clutter. Bookmark the permalink. Very funny blog John. Made me giggle. I think I like this new idea of yours to put the Bears in charge of de cluttering – especially so since, for the first time in our 42 years together, you are going to start cleaning toilets. Now that’s something I never thought I’d ever see! I am not sure how to respond to this ‘Blog’, and I cannot remember George or Walt, mentioning such matters, All the ‘—Ucets’ come to mind, and the the final ‘tucket’ and that smile when one leaves the ‘nettie’, having achieved, that one daily pleasure, of total and utter enjoyment..
That smile, or grimace, on ones ,fizzog’ or ones sunday face!!! Bare essentials as you comment. Memories of the paper qualities ”IZOL” -now please wash your hands! That gloss toughen glass paper, with which ones fingers were safe, from touching the ‘brown matter’. I note you have not mentioned a luxury of a fashioned ” swans neck”??? Enough of this earthy matter, and weighty considerations? It is good to see and read ‘Teddies’ exploits. How ever how observant has one been??? Spring is here 21 march, has one tied the daffodils back (Not cut them)-Alas with the crocus’s have now gone past their best, and the primula’s and primroses are in full bloom, and as I look out of my sitting room window, I have the utmost pleasure in admiring the apple blossom, and the flowering cherry trees. By the way it is time to end this de-clutter, listen to Teddies, and having had the winter to think about how and why to de-clutter, you must take the bull by the horns and do a total ”spring clean”: One has had the winter to think one must now act, as a gentleman, and do the ‘task” in hand. By the way have you committed your self to the first ‘cut” of the lawn, overhauling and oiling and sharpening the mower bits and pieces. It is time to start the new year, with fresh eyes, and new vigor and energy, and do not forget tat enthusiasm for life!! with zest! !